KEEPER OF THE SNAILS: Good to be God and an Interview with Tibor Fischer. Good to be God and an Interview with Tibor Fischer. 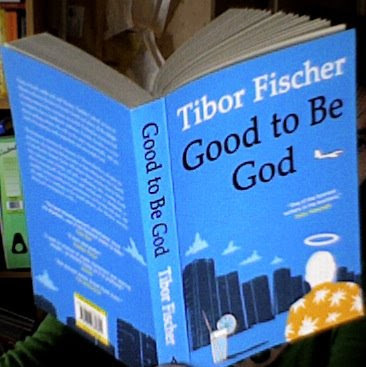 A few weeks ago, I was approached by a publicist from the independent press, Alma books, and asked if I would be willing for my blog to take part in a book tour for Tibor Fischer's book Good To Be God. So because I happened to be between projects I said yes. The Review of the book and an interview with Tibor Fischer follows below. In one scene somewhere in the middle of 'Good to be God' the narrator, Tyndale, the temporary head of an independent church, sends his two aspiring side-kicks, Gamay and Muscat, to find the lover of one of his erring flock. At first they kidnap the wrong man, the second time they manage to get it right but their victim seems disappointingly unperturbed. In order to intimidate him Tyndale attempts to shoot him in the toe, but he finds hitting the target more of a challenge than anticipated. Eventually he decides to dump his slightly hurt, but still contemptuous hostage, to some waste ground outside Miami. Job done, they start back only for the car to break down a short way along the road. Tyndale, of course, has no idea of how to fix it and neither do his henchmen, so they are forced to wait for breakdown services. This is funny enough, but the punch-line is yet to come - and this is thrown in lightly and with perfect narrative timing - just before the pick-up van appears Tyndale can just make out their victim getting on a bus for the centre of town. The book ends happily; sometimes even the most luckless can find their own paradise, and deification is not always essential. It has whetted my appetite for Tibor Fischer's work and I certainly intend to seek out more of his work to read in future - in fact I have already ordered UNDER THE FROG (which was short-listed for the Booker Prize) and look forward to reading it. Tibor Fischer was born in Stockport of Hungarian parents. Brought up in South London, he was educated at Cambridge and worked as a journalist. 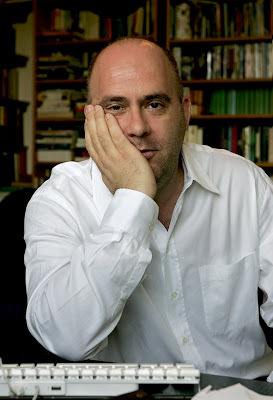 He was shortlisted for the Booker Prize for his first novel, Under the Frog, which also won a Betty Trask Award, and he was nominated as one of Granta's Best of Young British Novelists. Subsequent works include The Thought Gang, The Collector Collector, Don't Read this Book if You're Stupid and Voyage to the End of the Room. CD: How did you start writing 'Good For God'? Were you obliged to go to sunny Miami for research? T.F: I was very reluctant to go because I get sunburnt easily, and the constant partying in Miami and the obligation to eat in hip restaurants are rather wearing, but as a novelist you have a sacred vocation to seek out the truth, no matter what the personal sacrifice or hardship required. CD: I thought your dialogue was magnificent - funny and yet convincing. Do you have any tips for writing great dialogue? Is it even possible to learn? T.F: Read Elmore Leonard. Listen to people. CD: How do you set about writing a novel in general. Is it the same each time? Do you plan? T.F: I don’t think any two writers work in exactly the same way. It’s not like making a chair, whatever Socrates says. I start with a vague idea, a character, a scene and I see what happens. I write as much to entertain myself as others. CD: Who is your first reader? How many readers do you have before you send a manuscript to a publisher? T.F: The first reader is obviously me. But I have a crack team of German advisers in a warehouse in Erfurt who cast an eye over the book before I send it out. Germans are tops at proof-reading. CD: How autobiographical is this novel? T.F: Well, in common with most writers, I feel I should be worshipped like a god. I don’t play golf. CD: What did you find more useful as a novelist: going to the University of Cambridge or being a journalist? T.F: The best thing was, for the few weeks I was on the shortlist, my publisher, Penguin, made some effort in pretending to be interested in my work. I found out I was on the shortlist when I was called by the Daily Telegraph. I didn’t have an agent. It was quite hard to deal with as it came after a long period of employment and isolated drudgery – I was like a mole dragged into the light. There’s no doubt the Booker made a huge difference to my career and essentially saved me from the obscurity most writers disappear into. T.F: I like eating them. I once had a memorable dish of snails with halibut in St.Petersburg. It was memorable, but, truthfully, not that great. One of my cousins used to deal in snails (really). TF: Getting an entry in the official history of Hungarian literature, without having written a word in Hungarian. The argument was that I am a Hungarian writer, but I’m just pretending not to be. TF: All events are life-changing. TF: Old whores in Hamburg. TF: Go back to bed. TF: Go back to bed." Just wondering: is he hitched up? Heh heh, good point CFR! boiled in a bag. TF is god.